Home » Baseball » The Yankees are going 162-0 this season!!! The Yankees are going 162-0 this season!!! The Yankees have played their FIRST game of the season and they absolutely DESTROYED the Toronto Blue Jays. The STARS of the Yankees SHINED today and the NEWEST Yankee Giancarlo Stanton was GREAT. On his FIRST at bat for the Bombers, Stanton went DEEP for a TWO run home run and the Yankees were off and running. He later drove in Aaron Judge for his THIRD RBI in the game, which currently leads the Majors. He ANOTHER Home Run in the NINTH inning and his Yankee debut could not have gone BETTER. Stanton is on his way to WINNING the MVP award and he is going to hit 324 home runs this season. Luis Severino pitched GREAT in his FIRST start of the season. This was the FIRST time that Sevy was the Opening Day starter and he did NOT disappoint today. Sevy is the BEST pitcher on the team right now and he is going to win the Cy Young award this season as he is going to be UNDEFEATED. Gary Sanchez joined in on the fun and drove in Stanton, so the Yankees offense if FIRING. Brett Gardner hit his FIRST Home Run of the season and this lineup keeps gettinbn scarier for opposing pitchers. This is the FIRST time that the Yankees have started the season 1-0 in a LONG time, which is an early sign that this team is going to be GREAT. 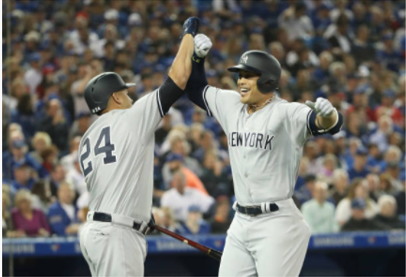 They will look to continue to be on pace to 162-0 tomorrow night against the Blue Jays, when Tanaka takes the mound for the Yankees and Stanton continues his pace for 162 home runs.